Hub Bay Area featured in Sierra Club Magazine! “We think of the Brower Center as more ‘art’ than ‘building,'” says Amy Tobin, the center’s executive director, noting the visible irregularities in its walls. 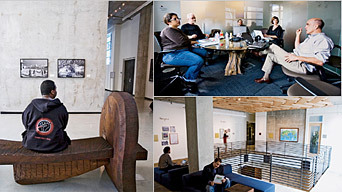 At David Brower Center, salvaged wood becomes a bench (left); thinkers convene in the Hub’s meeting space (top right); woven wood graces the atrium (bottom right). At the Hub, a “coworking space” in Berkeley, California, ambient sunlight plays across two dozen figures hunched over laptops at petal-shaped tables. They peer into the future while surrounded by the past. A new activist center and sustainable food business is opening in the East Bay! After a launching successful campaign to prevent a national fast food chain from securing a contract, the food movement secured 120k to open a storefront in its place. The Berkeley Student Food Collective will open its doors in August as a local, sustainable cafe and community center. We’re having our big bash on Friday, come support the movement!